Posted: Thu Apr 10, 2008 11:35 pm Post subject: New Zealand Flatworm?? So, I started digging in the garden today - unfortunately, the soil is very clay-like, so for my little trees, I dug a huge hole & mixed in a lot of compost with the soil to prepare the ground..... now, we have a new house & new garden, so there is a lot of hard-core infill, so also lots of big stones to take out! So, I researched on the web & found a site about the New Zealand Flatworm - so now I'm worried! It also states that they have been found in the UK - Wales, Scotland & N. Ireland. Does anyone here know anything about these? If I should find anymore, should I be notifying anyone? Apparently, they're not good for the garden or soil & feed on normal earthworms. Squash it! Though that takes a bit of doing - I usually squash between two stones.... keep an eye out for the eggs too, they are round, shiny and black. Horrible things, they live off earth-worms, and they've been around for quite a while now. JulieSh I hope you have not, but if you do have a fair population of these pests, it should be easy enough to capture a few. Lay out a few sheets of black polythene or silage cover with some stones holding it in place. The flatworms will group underneath this, with the best time to check in the early morning. I would love to see a photo posted if you take one, as it will inform all the other members about flatworms. Thanks for the replies - I only wished I had kept it now until I had had a chance to do some research! I have a tel number for someone in N.I. concerning these worms & I am going to call him on Monday, just to clarify. Also, the mucus on these worms can be irritating to us & our skin, so any touching/squashing must certainly be done with gloves on! Now, my other topic today is digging up the thousands of thistles in the lawn... Grr!! Tougher gloves are now on my shopping list!! I live in Castlepollard, near Mullingar and we have 0.6acre of garden... we have discovered since we moved in over 3 years ago that we have New Zealand Flatworms all over the place too!!! I have tried to see if i should be reporting this, but the little info i found on the net in this regards has been of no help to me as all seems to direct me to England or Northern Ireland. The only thing is you need to make sure you put weight over the plastic (stones or even some garden debris) and leave it in the same spot for several days otherwise they won't go under it... If you check under the plastic after a few days it will give you an idea of how commun they are in your garden. Anyway, if anyone knows if i should be reporting this issue. please let me know who to go to! Good to hear the plastic trick is working for you. It would be great to get feedback from other parts of the country. 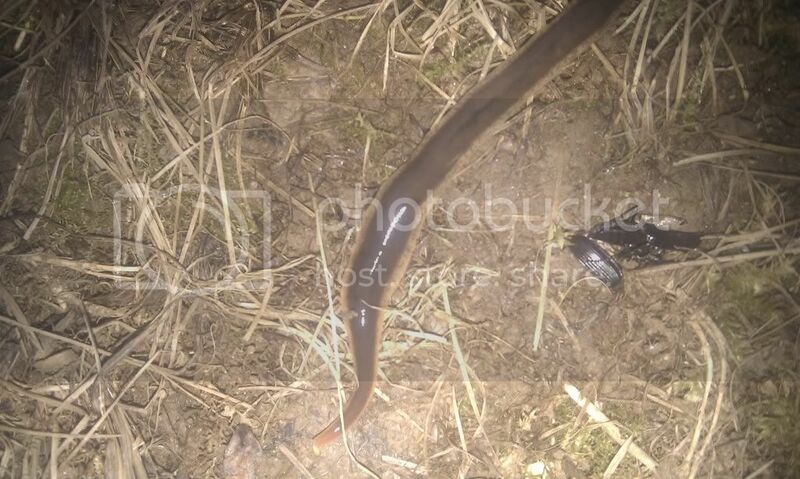 So post away if you've spotted any flatworms in your site. You can report it on the web site below. If you have a picture of the species or are unsure of what you have found, please submit your images through the form below. I discovered a New Zealand flatworm in the bottom of a raised bed yesterday when I removed one of the ends. It was also surrounded by small white 'eggs'. I have the horrible things in my garden [i]and[/i] I have a noticable shortage of earth worms. I was hoping against hope that they might, at least, eat the leatherjackets since they are such bad news in every other regard, but after presenting one with a leatherjacket in a jar, I really don't think they do. Anyway, they are here on Torr. I can only imagine that they arrived in top soil or compost some time in the past. Does anything eat them? Birds, pigs, hedgehogs, anything at all? I also have discovered flatworm in my garden so I did a little research about them. Not much will feed on them. Even my ducks spat them out when offered them. But I have read that ground beetles will eat flatworms and that if you can encourage these all the better. Also if you build up the humus in the soil to encourage earthworms an equilibrium may be achieved. Not enough research has been done on this invasive pest but the more that report sightings on the previously mentioned website http://www.invasivespeciesireland.com/sighting/ the more can be learned. Another report of a flatworm here although belatedly. These pics are of a flatworm found in my Galway garden in late summer 2010. I laid him out on a blue bangor slate for all to see. one thing you can say - he ain't pretty. First time I have noticed these buggers before, but then again this is the first time I have got stuck in to the gardening..found two today, and I suppose when there is two, plenty more will be found. Will have to keep an eye out for them.